A new disagreement over the state constitution surfaced Wednesday at the Minnesota Capitol when Gov. Mark Dayton named Lt. Gov. Tina Smith to the U.S. Senate. The Minnesota Constitution states that "the last elected presiding officer of the senate shall become lieutenant governor." That presiding officer is state Sen. Michelle Fischbach, R-Paynesville. She says she's ready to fulfill her constitutional obligation to assume the office — but she doesn't plan to give up her Senate seat. A memo from the Senate's top lawyer backing up her position cites an 1898 Minnesota Supreme Court ruling that decided the same question. In 1898, the lieutenant governor presided over the Senate. A 1971 constitutional amendment separated the two jobs. A 1968 amendment prohibited senators or representatives from holding "any other office" but the Senate lawyer contends the "core reasoning" of the earlier court decision still applies. He did, however, warn Fischbach that her plan to hold two offices at once could be challenged in court. Dayton, who is fresh off a Minnesota Supreme Court win over his veto of legislative funding, said his office's legal counsel offered a different opinion on the succession question. It said Fischbach cannot hold two offices at the same time. The governor has asked Attorney General Lori Swanson for a formal opinion on the issue. "My goal is to assure Minnesotans that I'm following, and we're all following, what's prescribed in the Minnesota Constitution and in statute without favor to one side or another," he said. Fischbach said she wasn't thinking about a court fight, but "we will address that if it comes to that. That's not an issue at this point." If Fischbach ends up having to surrender her senate seat, it could put Republican's slim majority in peril. As of Friday, the GOP will hold a 34-32 advantage, pending a special election to fill the seat vacated by state Sen. Dan Schoen, DFL-St. Paul Park. Not surprisingly, Senate Democrats are pushing hard that the constitution requires Fischbach to give up her Senate seat when she takes the lieutenant governor job. They want another special election and the chance to pick up a seat. Dayton said Republican Senate Majority Leader Paul Gazelka, R-Nisswa, asked him about the possibility of a special legislative session to elect a Democrat to replace Fischbach as senate president, so that person could then become lieutenant governor. But Dayton said he's not interested. There are also questions about a DFL governor who's wrestled with health issues having a conservative Republican move next in line to succeed him. Dayton said he invited Fischbach to lunch Friday to discuss the succession and her role as lieutenant governor. And he added that he's not going anywhere. 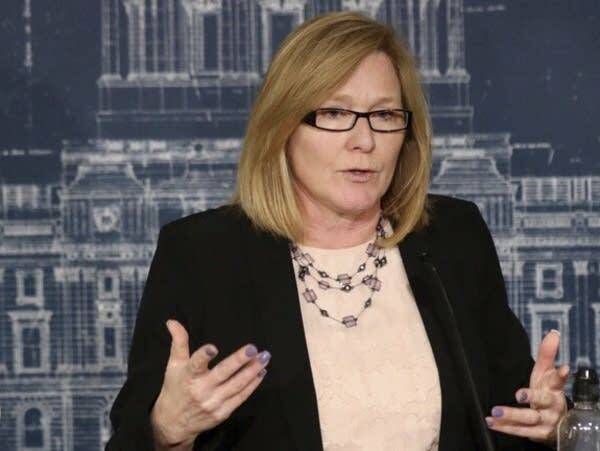 "I look forward to working with Sen. Fischbach, if she becomes the lieutenant governor, and we'll develop a cooperative relationship," Dayton said. "And I'll do my best to stay healthy, so she gets to be lieutenant governor for the next 400 and some days."